There have been plenty of warnings lately that using a digital device before bed could be messing with your sleep. As CBC Radio technology columnist Dan Misener explains, Apple has revealed a new feature the company claims makes screens easier on your eyes, and your sleeping habits. There have been plenty of warnings lately that using a digital device before bed could be messing with your sleep. Now, a major smartphone company is touting a solution. As CBC Radio technology columnist Dan Misener explains, Apple has revealed a new feature the company claims makes screens easier on your eyes, and your sleeping habits. 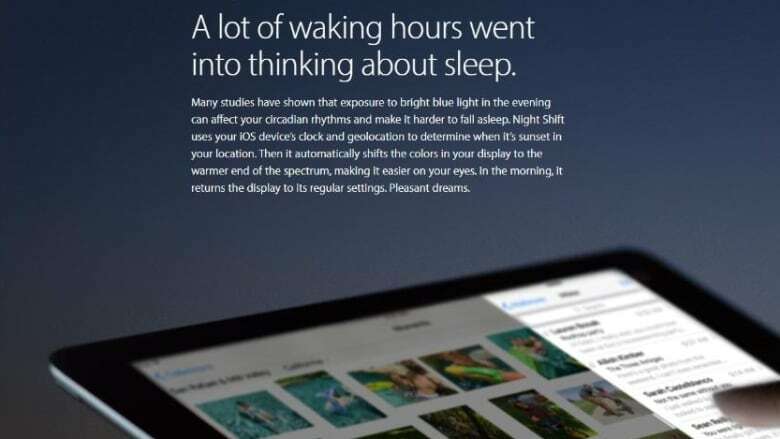 As part of their latest operating system for tablets and phones (iOS 9.3, currently in beta mode), Apple has launched a featured called "Night Shift." Essentially, it will automatically adjust the colour of a device's screen, based on the time of day and where you are. So in the evening, for example, the software starts to remove some of the blue light from your screen, which has been shown to affect the body's natural sleep cycle. When the blue light is filtered, the screen gets a much warmer-looking colour, with everything turning a bit yellowish-orange. Apple says this is easier on the eyes, and "may even help you get a good night's sleep." What makes mobile devices problematic for sleep? 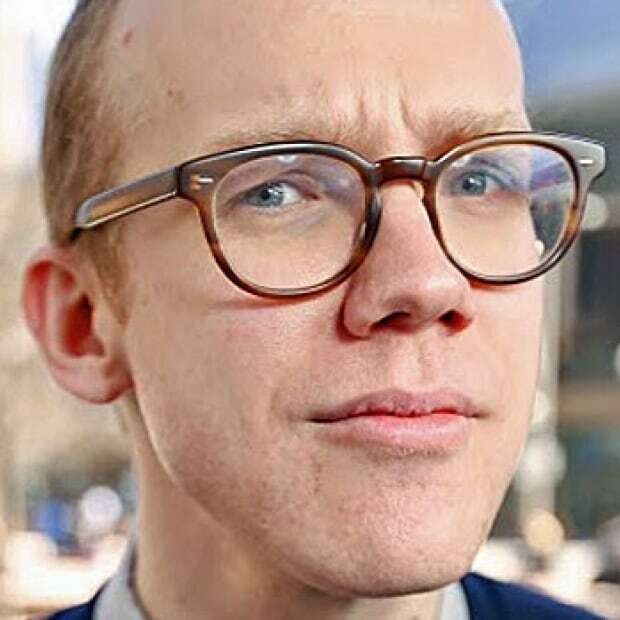 Psychologist and sleep researcher Dr. Brandy Roane, with the University of North Texas Health Science Centre, confirms that blue light is part of the issue. But she also said blue light isn't the only factor — we also have to consider engagement. A smartphone isn't just a bright light. It's a bright light with your email and Facebook and Instagram on it. "The light being produced will, to some extent, suppress your melatonin levels," she said, referring to the hormone that plays a role in our sleep-wake cycle. "But also you will become engaged in the activity, and that stimulation will also suppress that feeling of sleepiness." Of course, it's tricky to tease those two apart — are you having trouble sleeping because the light from your phone is too blue, or because your Instagram feed is too interesting? It's important to point out that Apple's "Night Shift" feature only addresses the light problem, not the engagement problem. Who else is working on removing blue light from screens? Apple is certainly not the first to do this. For years, there has been software that does pretty much exactly the same thing. Programs like f.lux and RedShift do this for laptops and desktops. And an app called Twilight removes blue light from the screens of Android devices. Drift TV is a product which claims to aid sleep by removing blue light from TV screens. (seesaffron.com)This sort of colour adjustment has also been built into hardware. Some television manufacturers make screens that can automatically tweak colour temperature based on the lighting conditions in the room. 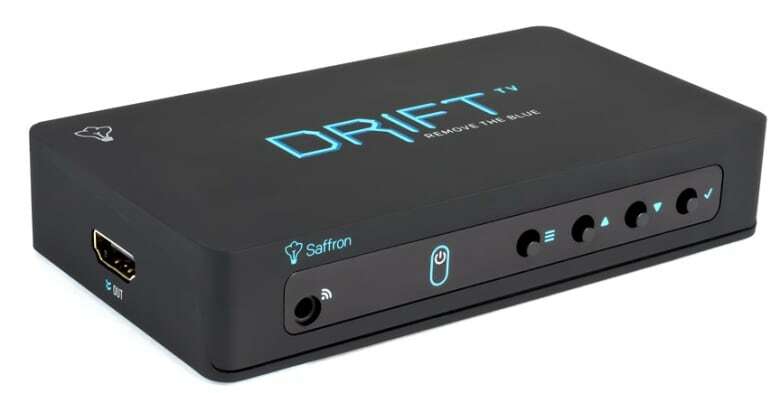 And a standalone box called the Drift TV brings this idea to pretty much any modern television. Again, Apple is not the first to implement a blue light filter. But given their user base and influence as a device manufacturer, it's significant they're building this directly into the operating system for every phone and tablet they sell. Are there downsides to removing blue light from screens? For one thing, it can make your screen look weird — with a definite yellow-orange tint. That can be a problem if you do photo or video work. But Dr. Brandy Roane said the bigger concern is how features like Night Shift might cause people to focus too much on the light factor, and less on the stimulation factor. "It's going to kind of lull you into a false sense of, 'I'm doing everything I need to, so once I get sleepy everything's going to be fine,'" she said. "That's not necessarily correct. You could still be delaying your bedtime without even really realizing it." What else should we be thinking about when it comes to digital devices and sleep? Roane is firm in her recommendation that digital devices stay out of your bedroom entirely. "So if you have an electronic device, it gets plugged in somewhere else," she said. "You make a point of having a charging station that's outside the bedroom. If you need an alarm clock, you actually go physically buy an alarm clock. Don't use your cell phone. And you make those choices, and you consciously adhere to those choices." Apple's Night Shift feature will be publicly available in the coming weeks, and it's worth a try. But even though removing blue light is a step in the right direction, it's not a silver bullet.